‘LowInput Breeds’ hosts technical notes which are particularly useful in providing insights into developing integrated livestock breeding and management strategies to improve animal health, product quality and performance. AHDB Dairy’s 'Breeding & Genetics' webpages offer a great resource to help you identify the cow genes best suited to your business and make your own livestock breeding decisions. 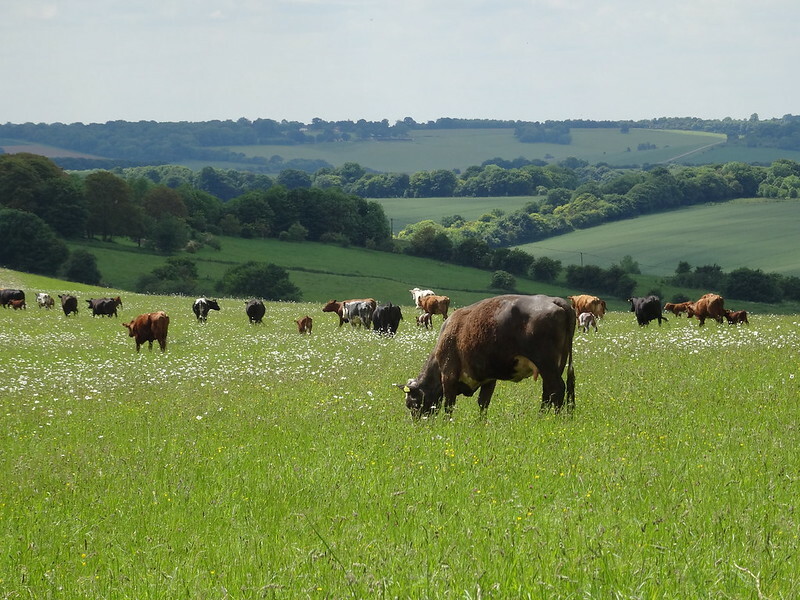 For organic, low input farmers, the SOLID project’s featured technical note ‘Breeding cows suitable for low-input and organic dairy systems’ provides insights into what you should consider when selecting dairy cattle for an efficient and low-input system. This is a theme that is also explored in June’s video blog by Richard Smith in which he explains how and why Daylesford Farm have bred back from the Holstein to the British Friesian in their quest for a dairy cow that is best suited to an organic system. The National Sheep Association (NSA)’s report ‘The Complementary Role of Sheep in Upland and Hill Areas’ emphasises the vital role of traditional hill and upland breeds in low-input farming; them being physiologically suited to the harsh conditions and efficient at rearing lambs and maintaining their own body condition. In another video blog featured this month, Louise King, Reserve Manager at Berks, Bucks and Oxon Wildlife Trust's Chimney Meadows Nature Reserve, talks about how they are using low-input livestock breeds to manage their grasslands for wildlife, forage and flood attenuation. Other content explores using livestock within cropping systems and ways in which they can be integrated... This is a topic that one of our featured news items from the Farm Carbon Cutting Toolkit celebrates in its ‘Winner of the 2017 Soil Farmer of the Year competition story’; the winners provide examples of livestock and crops being integrated to help build soil health. Ian Wilkinson, managing director of Cotswold Seeds keenly advocates this. You can read about his approach in the Soil Association report ‘Digging the Dirt on Honeydale Farm’, in which he describes the sheep that rotationally graze the deep rooting herbal leys as being fundamental to the system, transferring fertility to the soil and also effectively helping to control weeds. One of our news items links to a recently published National Sheep Association report which promotes the benefits of sheep in arable rotations. In the Nuffield report ‘Achieving more from less with dairy and arable’, the mutual benefits that can be attained from arable and dairy enterprises cross-over are explored. It has been a very busy month for key farming events, one of which was the Allerton Project’s open day, celebrating 25 years of farmland research. Their reports that were launched at the event are now available on Agricology - look out for them being promoted again next month when we will be touching on the themes of exploring soil biological activity and managing pests and diseases. One event to look out for next month is NOCC (National Organic Combinable Crops 2017), the OF&G annual farming event, follow the link from the newsletter and find out more by reading Phil Sumption’s blog. As always please get in touch if you would you like to share insights with the agricultural community - on enquiries@agricology.co.uk. Connect on social media; Facebook, Instagram, Youtube, and use @agricology to join in the conversation on Twitter. Janie Caldbeck is the Content Editor for Agricology.